Following the rebranding, Euroview also need to improve their digital footprint and marketing. Much like their previous logo, Euroview’s website was outdate and not representative of their true offering or indeed the nature of it. Everyone agree it was all too colloquial. Their new website needed to reach out and appeal to a new audience with the focus on the commercial venture as opposed to domestic. Thump wanted to focus on clarity, in a multi-faceted format. We knew the website needed to give clarity into exactly what Euroview’s abilities and previous projects were. Following demographic and competitor research, we saw that case studies were important in the industry. 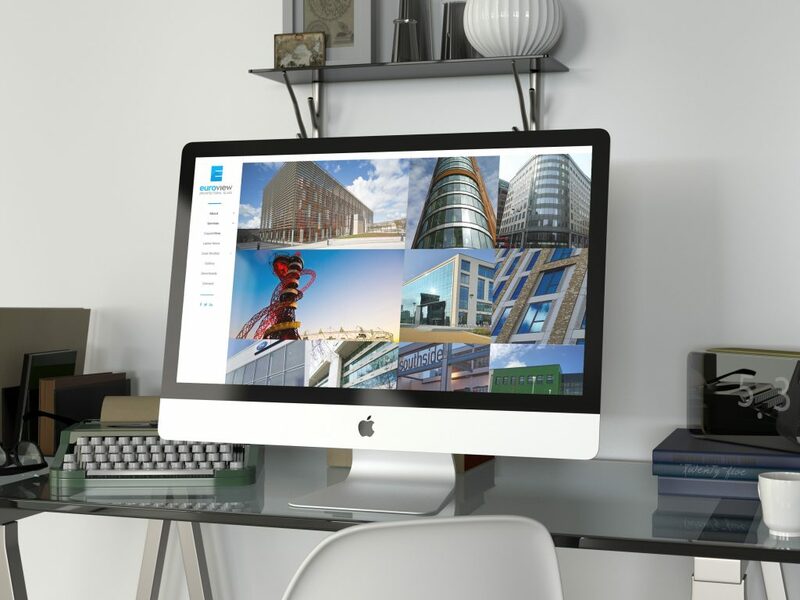 Our website design and build needed to be flexible to accommodate both copy and images well in order to create a successful user experience journey through the site. The final result was a website that was striking, user friendly and cross-device compatible. The design was heavily influenced by architecture. There is a linear and structural theme running throughout, both in the layout and design build. We wanted to showcase the case studies and projects that Euroview has done with CMS built behind it, to ensure it never becomes outdated. These projects are able to show the breadth of different application of Euroview’s capabilities. The simple clean lines of the brand translated through to the website in a number of different ways. With a large focus on the website to be aesthetically pleasing, we used linear icons, accordions, succinct pockets of information, and parallexes throughout.